After a long week of being sick, I’m ready to enjoy a leisurely morning with some coffee and a brand new KanColle Super Premium figure from the wonderful folks at SEGA. These SPM figures are presented in a roughly 8-inch scale and they’ve been digging pretty deep on the character selection, which keeps me coming back for more. 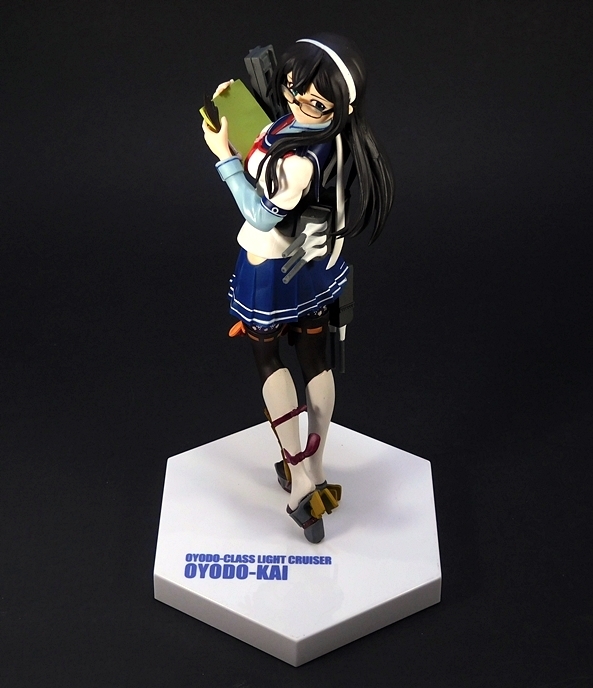 Today’s Fleet Girl is the Light Cruiser Oyodo in her refit “Kai” form. 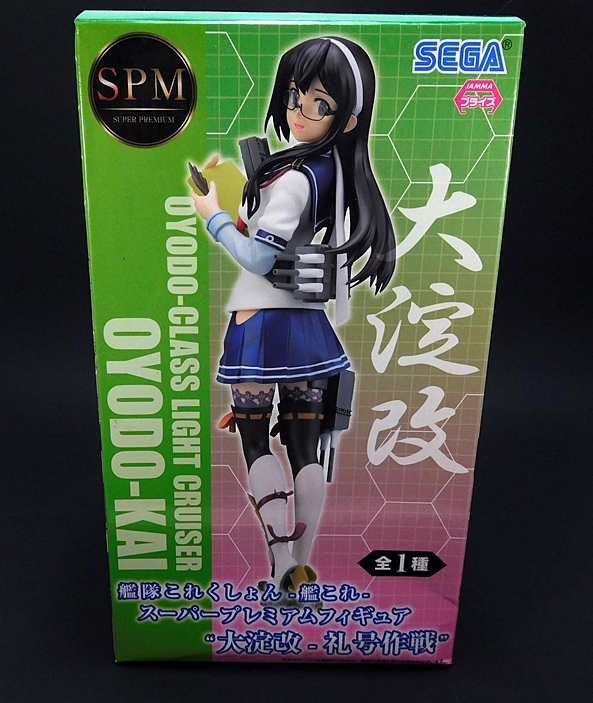 As always, SEGA’s SPM Fleet Girls come in standard enclosed boxes with a shot of the figure on the front, character art on the side panels, and lots of Japanese copy on the back. There’s very little English here, so hopefully you know what you’re getting. 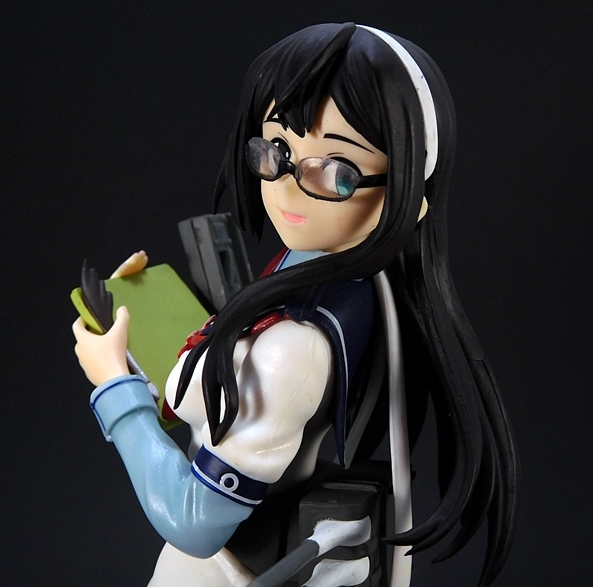 These boxes usually arrive pretty badly beaten up, but Oyodo’s is actually in pretty nice shape. 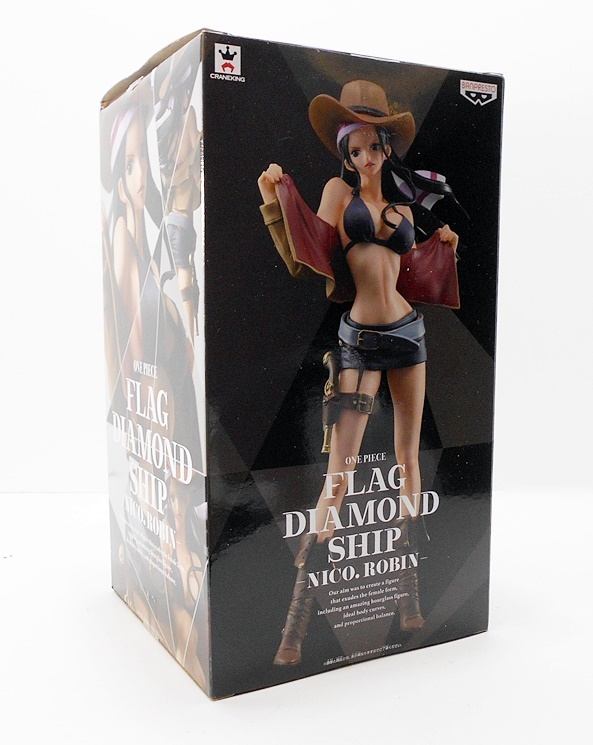 Inside, the figure comes between two clear plastic trays. The only assembly required involves plugging her into her base. 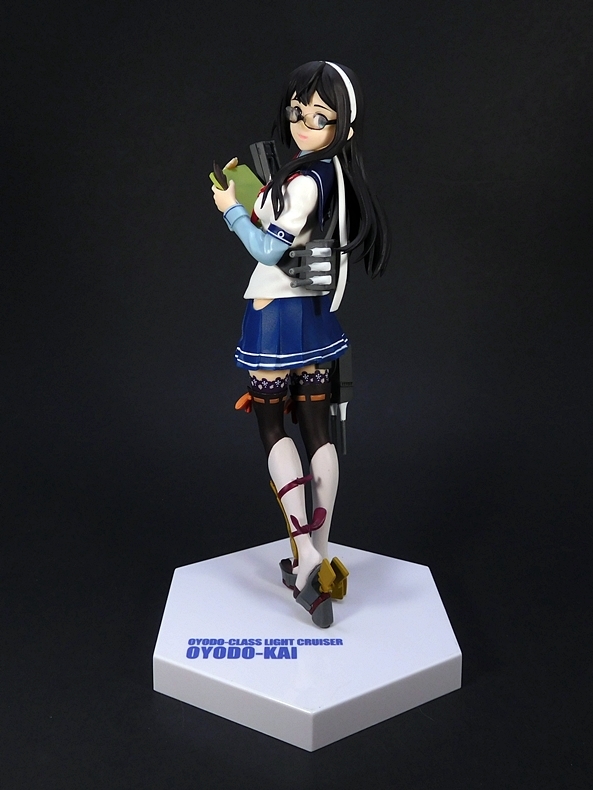 While Oyodo-Kai is a fully armed Light Cruiser, she’s known more as an administrative “Mission Girl,” and only really sees action if you happen to be playing as her in the game. Likewise, she never saw action in the anime either, but rather served as assistant to Battleship Nagato and relayed action orders to the Fleet Girls. 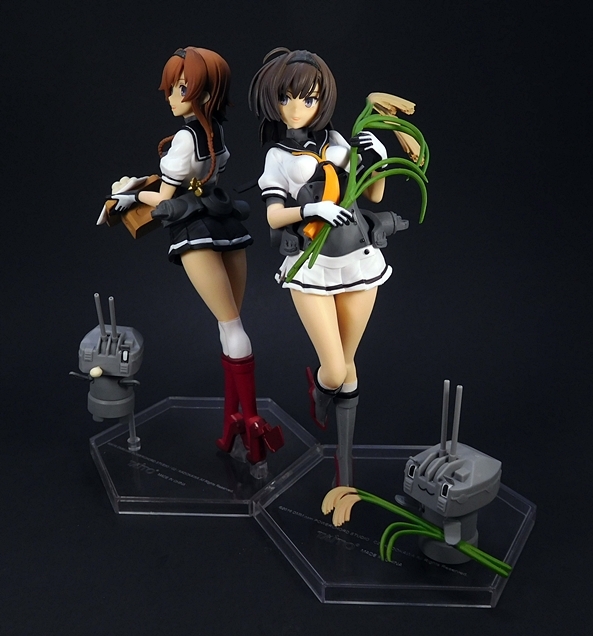 Even in the final battle when Nagato and Mutsu hit the water for action, Oyodo was nowhere to be seen. Her administrative nature is nicely reflected in the figure, which stands with clipboard in hand and turning in mid walk, as if to receive some last mission detail before hurrying off to relay orders. Her outfit is rather unique among the Fleet Girls, and while she retains the familiar sailor-type uniform, she wears the top over an office-style long-sleeved button-down blouse with a red necktie. While she looks like all-business from the skirt up, she’s got a bit more whimsy going on down below decks. She’s wearing a pair of thigh-high stockings with lace around the tops and tied with pink ribbons just below. Over those she has white boots with gray, red, and gold rudder boots. 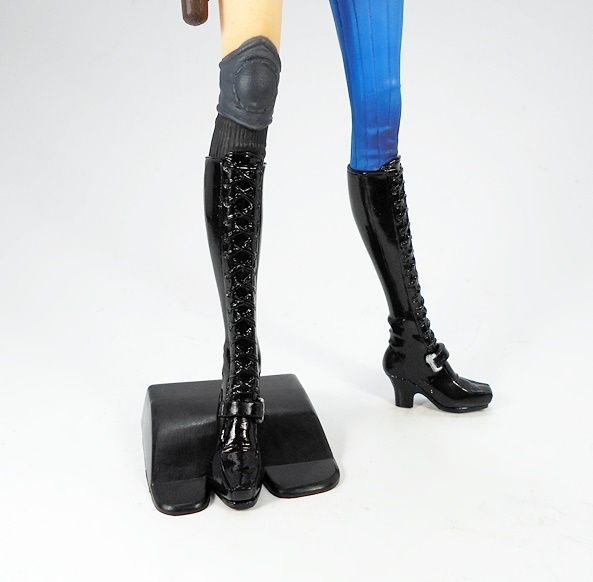 Finally, she has a single piece of armor on her lower left leg, tied with two red ribbons. The portrait here is pretty nice, but maybe not one of their best. I think maybe if the mouth was closed it would match the character art a little more closely. I do, however, like how they did her glasses, and they definitely add to her official administrative look. One thing that’s noteworthy is the white head band, which is correct for this refit “Kai” version. On the other hand, I’m pretty sure that as Oyodo-Kai, this version should have flower patches on her lapels, but they seem to have been omitted. 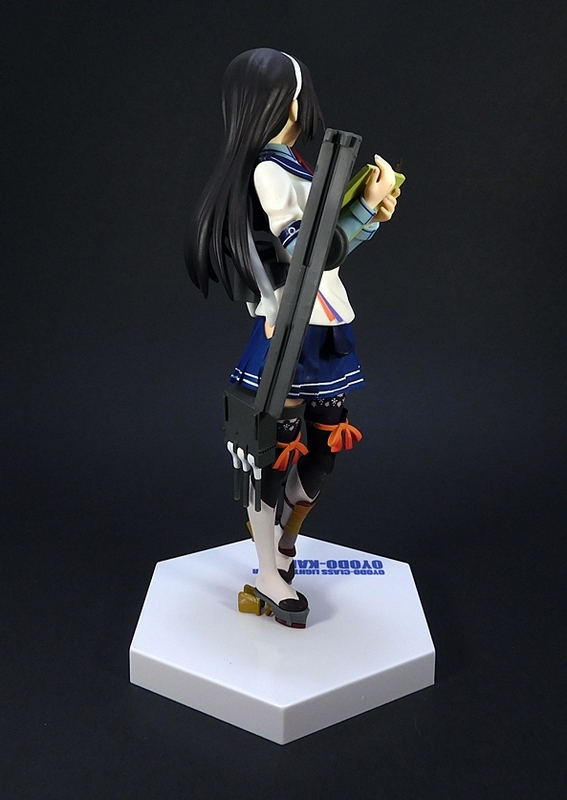 Oyodo-Kai may be a Mission Girl, but she still retains her armaments. 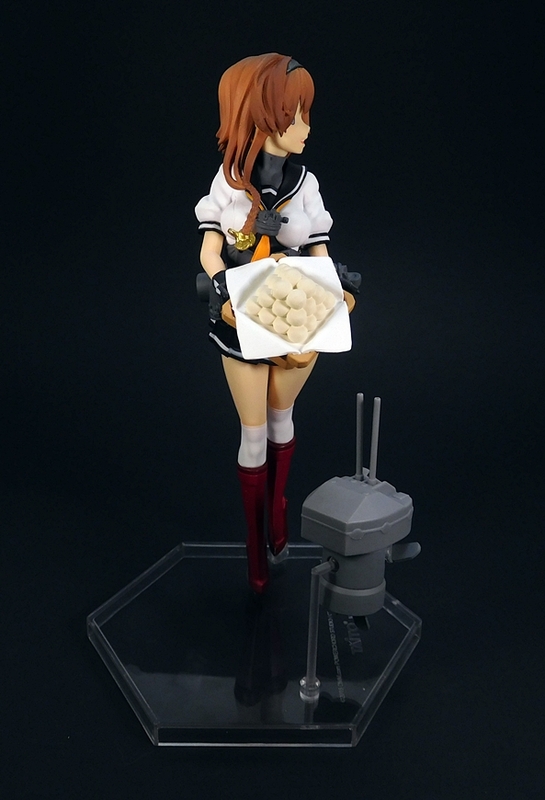 In this case, that includes her twin 15.5cm gun mounts, one of which she wears across her back and the other on her right thigh. 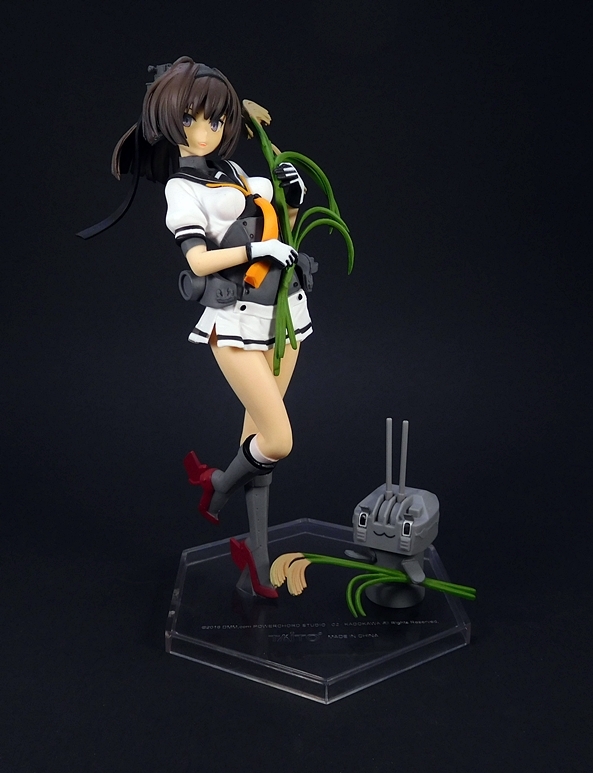 She also wears her catapult on her right arm, used for launching her Type 0 reconnaissance seaplane. 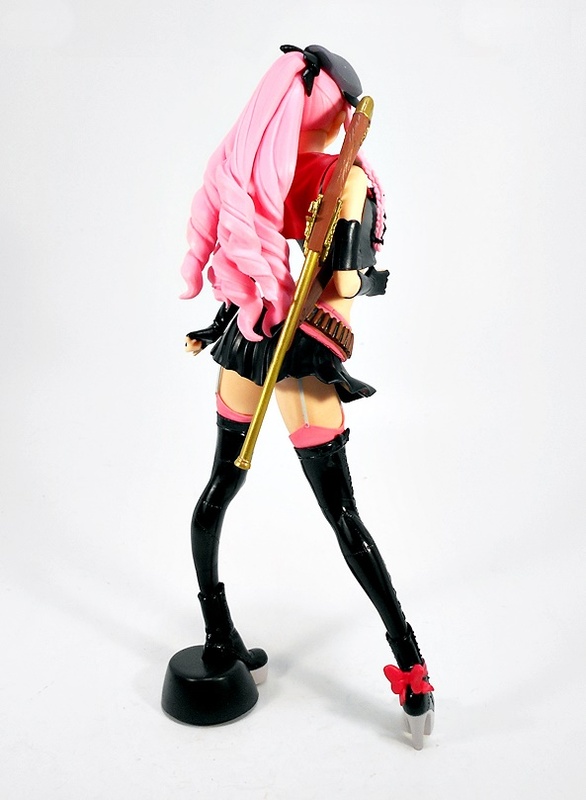 Her full gear would also include a considerably large hull part on her backpack and extra guns, which SEGA wisely omitted from this figure, probably because it would have been too big and ungainly and I’m fine with that. 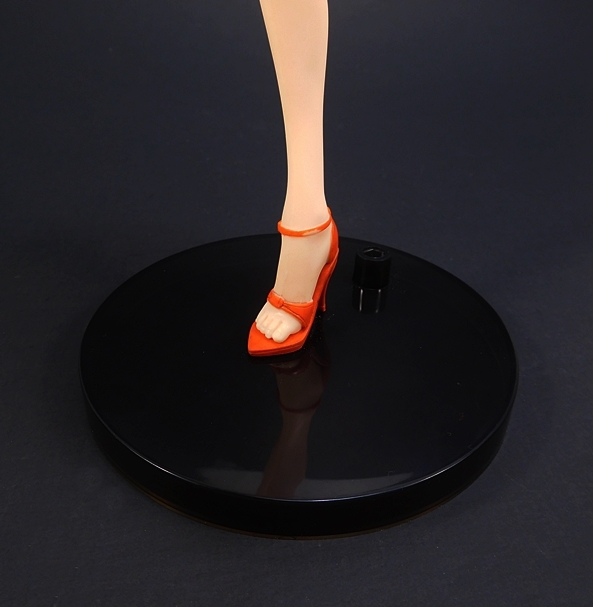 Oyodo-Kai comes with a white hexagonal base, which is similar to several of SEGA’s previous SPM releases. Her name is also printed in blue near the front and off-center. 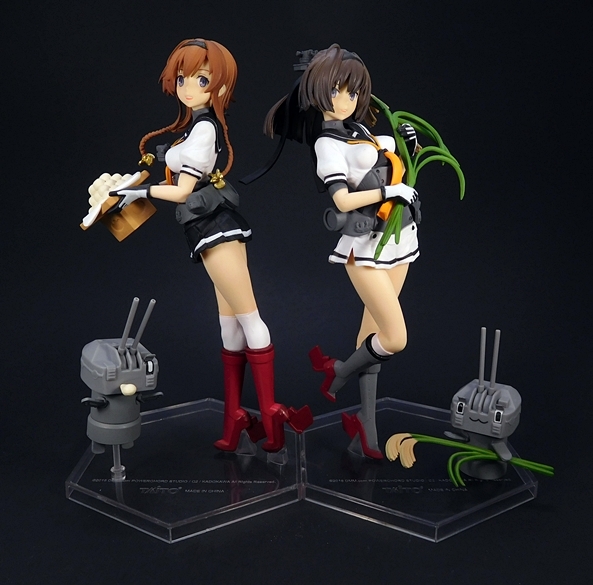 These are more or less standard designs for the SPM figures, although they do change them up from time to time. 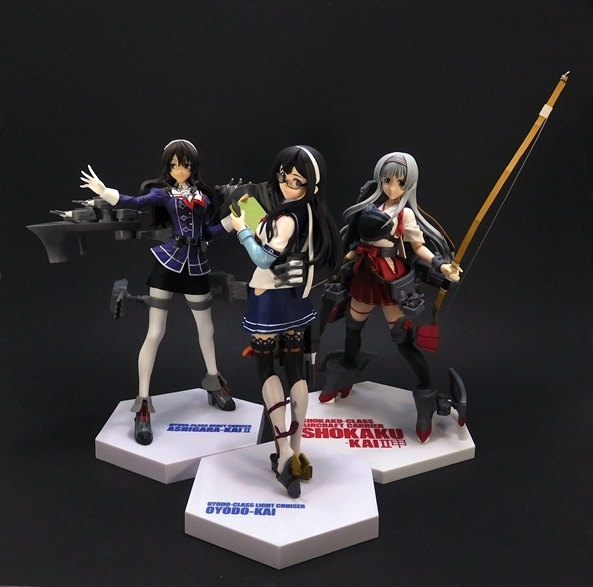 And here’s a shot of Oyodo-Kai with Heavy Cruiser Ashigara Kai II and Aircraft Carrier Shokaku Kai II. No matter what ships I assemble in the fleet, these gals always display beautifully together. 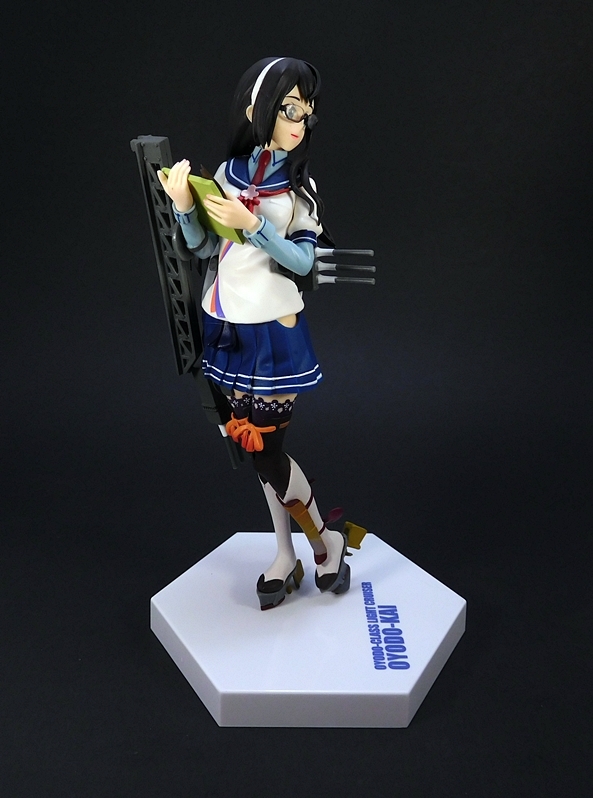 As a characeter, Oyodo was not terribly high on my list, but as I fill out most of Kantai Collection’s heavier hitters, I’m having fun picking up some of the back-benchers as well. 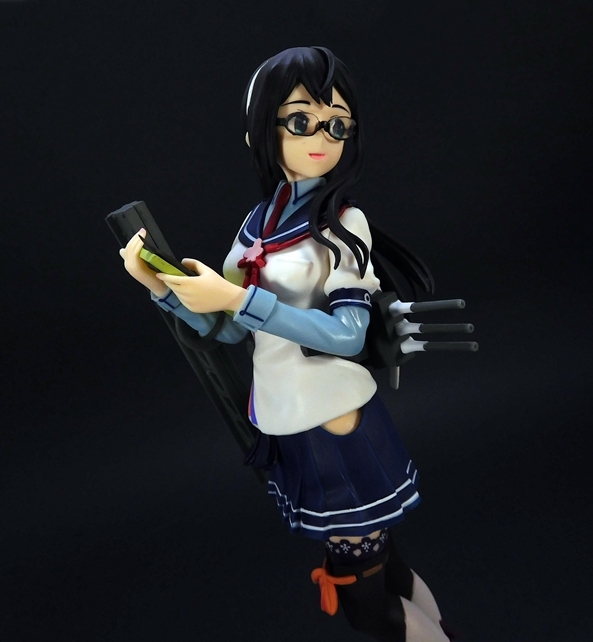 Besides, Oyodo really brings a lot of charm to my collection with her rather distinctive outfit. And it doesn’t hurt that both the sculpt and paintwork on this figure are excellent. I snatched her up off of Amazon for $18 shipped and I’d say as far as missions go, that was a success! It’s Saturday… who’s ready for some more KanColle? Well, don’t everybody raise their hands at once. Sheesh. On the last Anime Saturday I opened up Taito’s “Moon Viewing” version of the Destroyer Teruzuki and pointed out that she was intended to be displayed with her sister ship. 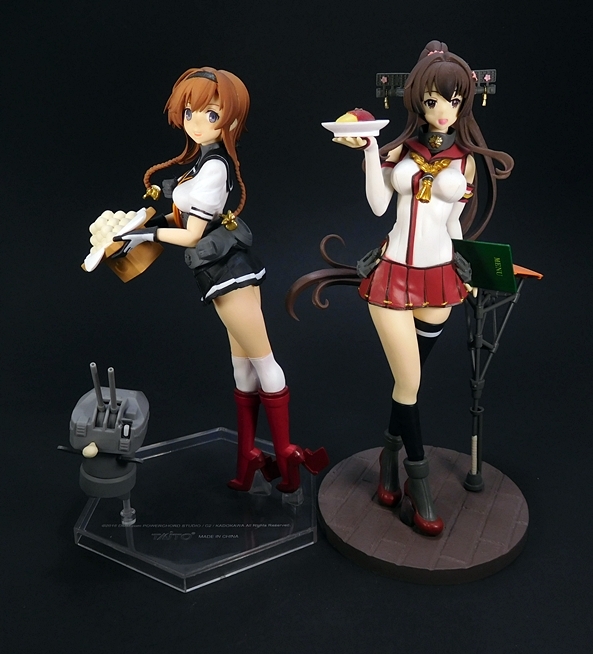 So here I am back as promised to open up the “Moon Viewing” version of Akizuki and finally get these two Fleet Girls together on the shelf. 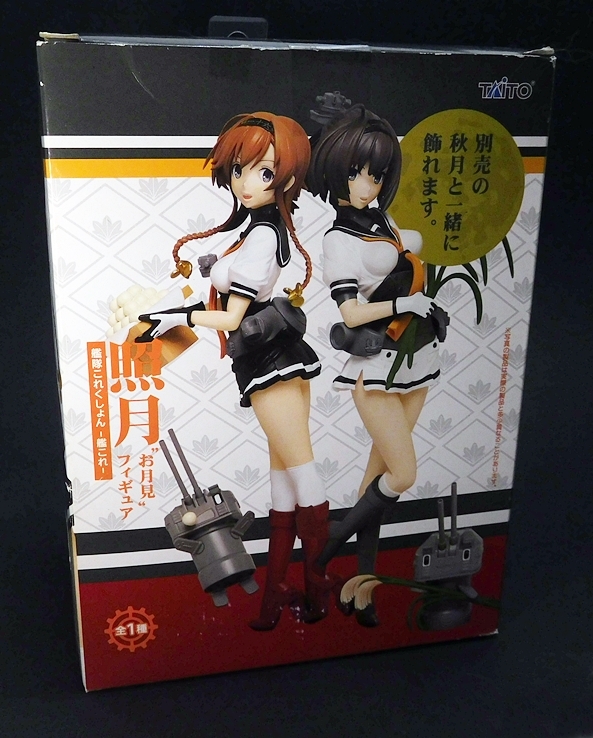 The packaging features the same style of enclosed box as we saw last week only with pictures of Akizuki on the front and side panels. The back panel, however, still shows both figures together, and it’s brilliant marketing, because I don’t know what kind of filthy animal could possibly buy one without the other and not feel empty inside. There isn’t a lot of assembly required. 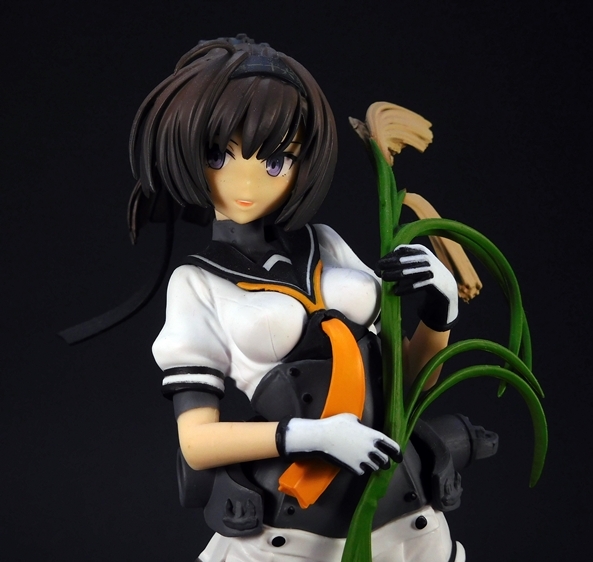 You just plug Akizuki into her base, put her Chou-10cm-hou-chan onto the base, and then put the Susuki grass into each of their hands. And here she is all set up and ready for display. Akizuki stands on one foot with the other leg bent at the knee and clutching a handful of Susuki Grass, which is a traditional offering at the Otsukimi harvest celebration, or Moon Viewing Ceremony. Her pleated skirt is a palate swap of her sister’s, so instead of black with a white stripe it’s white with black stripe. The top, however, is the same, mostly white with a black collar and white stripe, and an orange neckerchief. 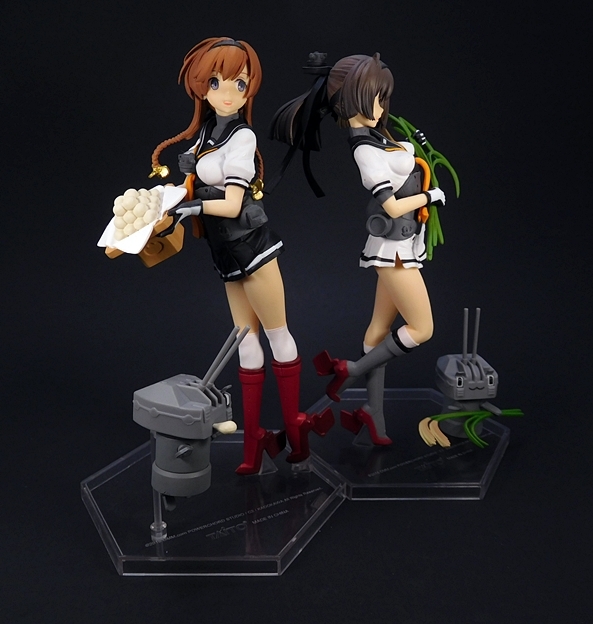 And while Teruzuki wears her Anti-Aircraft Fire Detector on her neckerchief, Akizuki wears hers up in her hair. 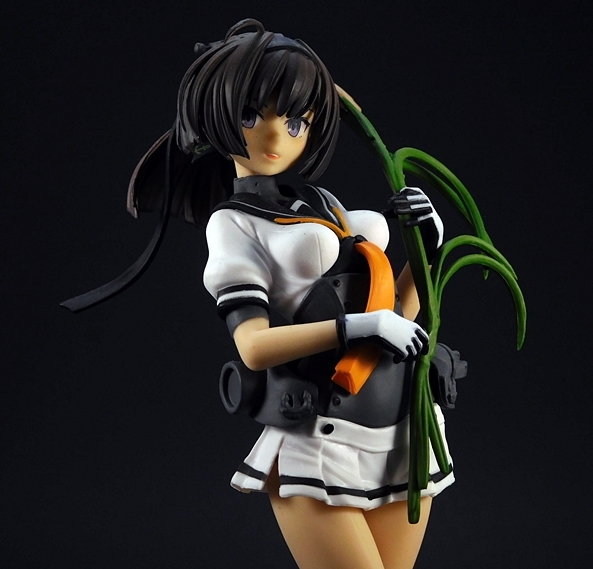 Of course, this “Moon Viewing” version is the equivalent of Taito’s “Day Off” figures, so Akizuki is not wearing her armaments. She does, however still have her arming mount belt around her waist where her weapons would attach if she were out on a mission. 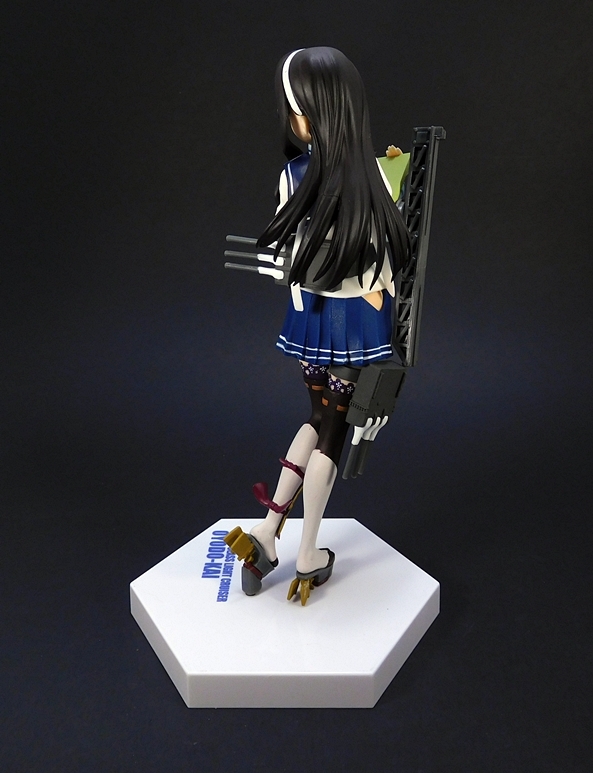 On the other hand, she does still have her rudder boots. 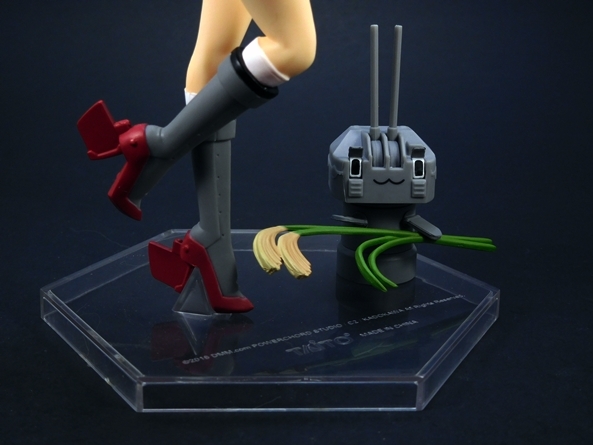 While her sisters boots were all red, Akizuki’s are mostly gray with red platforms and rudders. The paint on this figure is quite good, both in quality and application. The white is very bright and clean and the flesh tones are smooth and warm. But that’s not surprising, as Taito rarely lets me down in this category. The lines between the white and black in her gloves could be a little sharper, but it’s not something that I’m going to fuss about when dealing with a figure at this price point. Sometimes her neckerchief is depicted as being more yellow, but here it’s orange, the same as it was with her sister’s. The portrait is excellent. 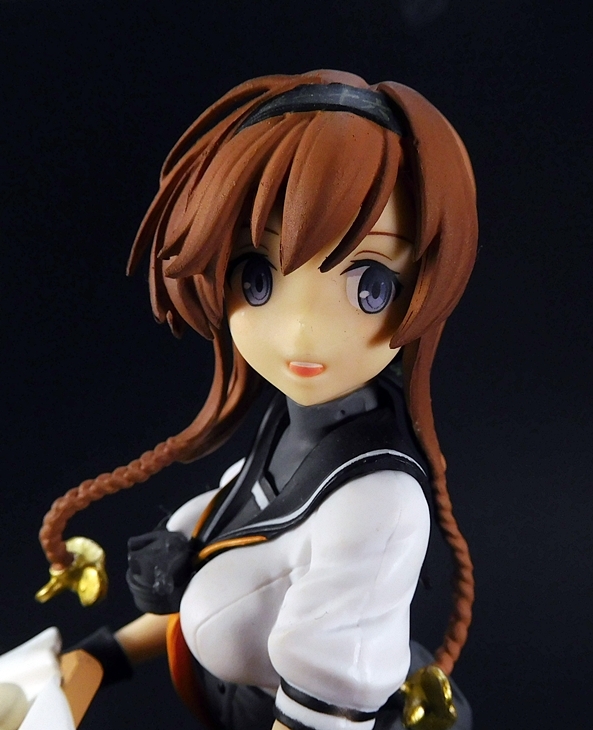 Akizuki is the older of the two sisters, and I think that’s reflected, as her eyes are not as wide as Teruzuki’s. I really like the depth to her hair and how it frames her face. Like her sister, she has a headband that reads “61” in Japanese, indicating that she is part of the 61st Destroyer Division. And as mentioned earlier, she wears her AA Fire Detector above her ahoge. The Susuki Grass does have a habit of slipping out of her left hand, something I noticed as I was handling her a lot, but it snaps back into place easily. 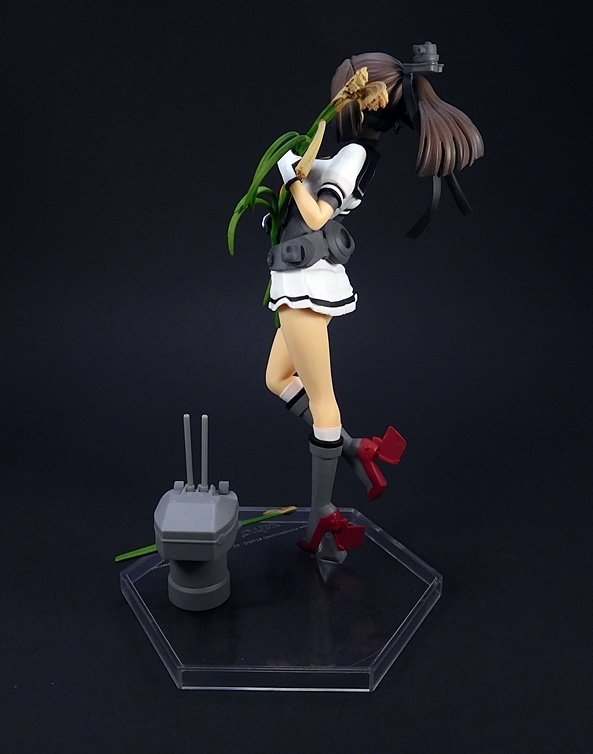 Like her sister, Akizuki also comes with her very own Chou-10cm-hou-chan, which is basically a little sentient gun turret, and he’s every bit as adorable as Teruzuki’s. He has both viewing ports open, giving him wide eyes and there’s a cat-like smile drawn on his face. The guns are articulated and are kind of expressive, like antenna. 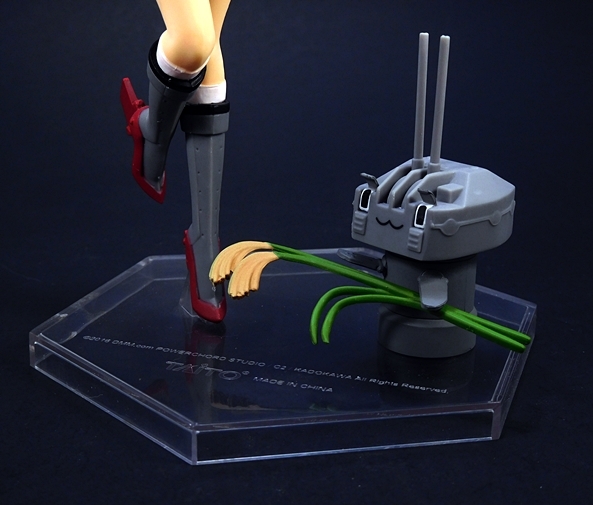 He’s also holding an offering of Susuki Grass in his little flipper-like arms, which attaches via a peg. Unlike Teruzuki’s little friend, this one doesn’t have a post to attach him to the base, so you can just position him anywhere you like. 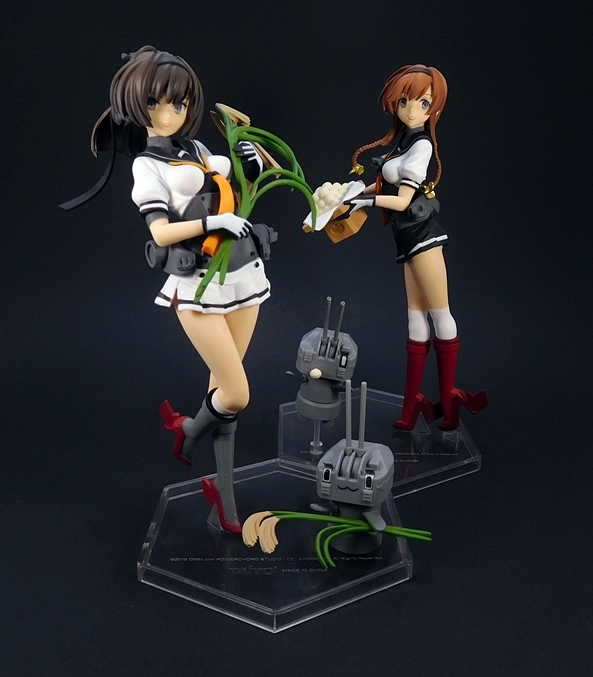 Akizuki’s base is a clear hexagon, identical to her sister’s. They’re set up so that if you put two of the sides flush with each other, the girls will be standing back to back and I think they look great together. 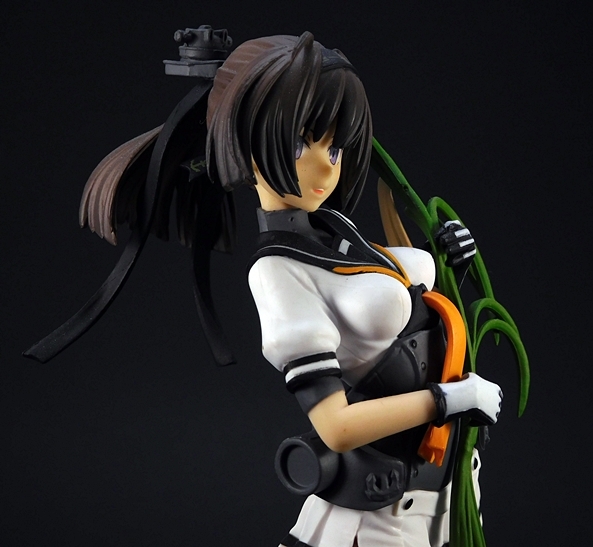 And here’s a quick shot of her with SEGA’s Super Premium Akizuki, which is all armed up and ready for action. 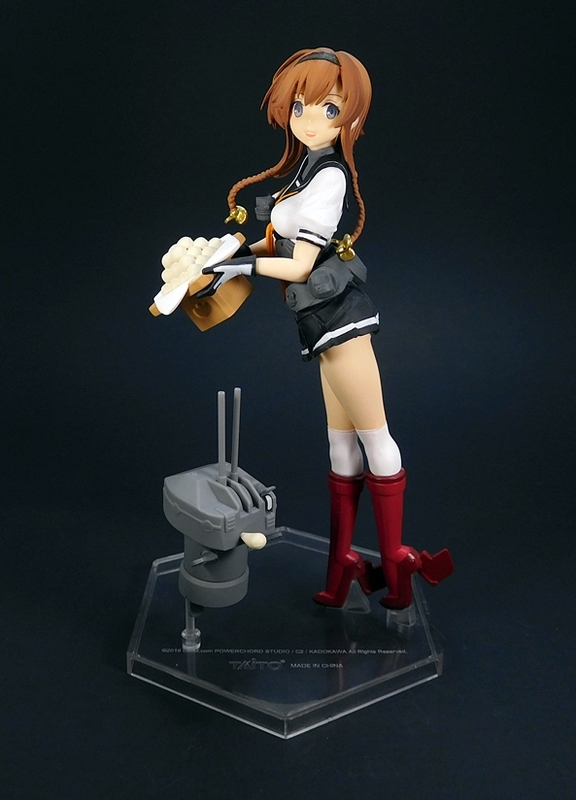 This is another fantastic figure from Taito and I love how she displays with Teruzuki. 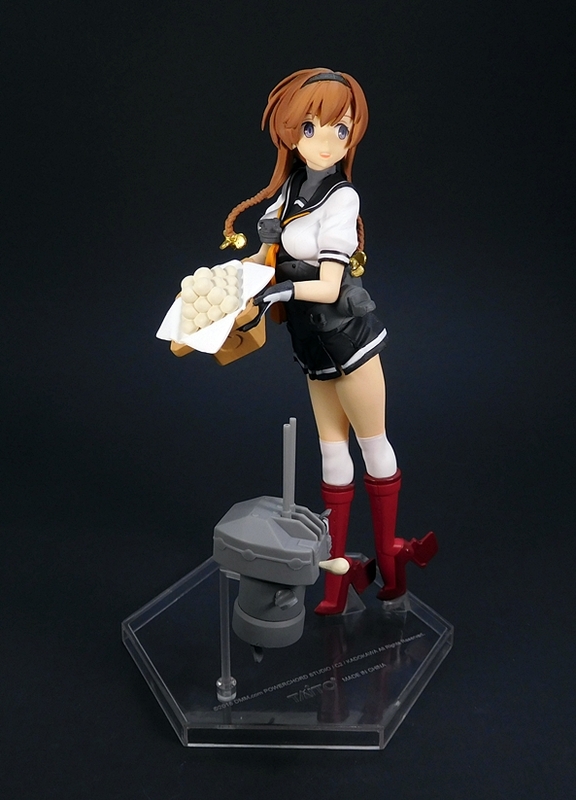 The only shame is that neither Taito nor SEGA appears to have released the third Akizuki Class sister-ship, Hatsuzuki. 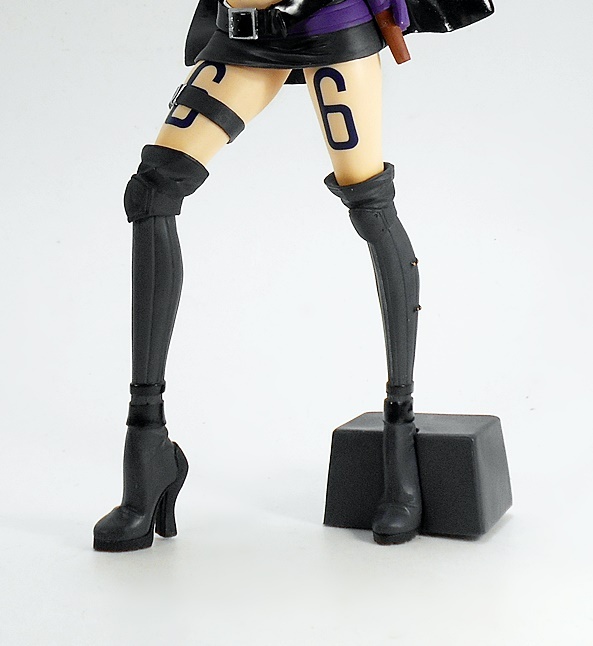 Good Smile has released a Nendoroid figure of her, but I’m not really into those all that much. 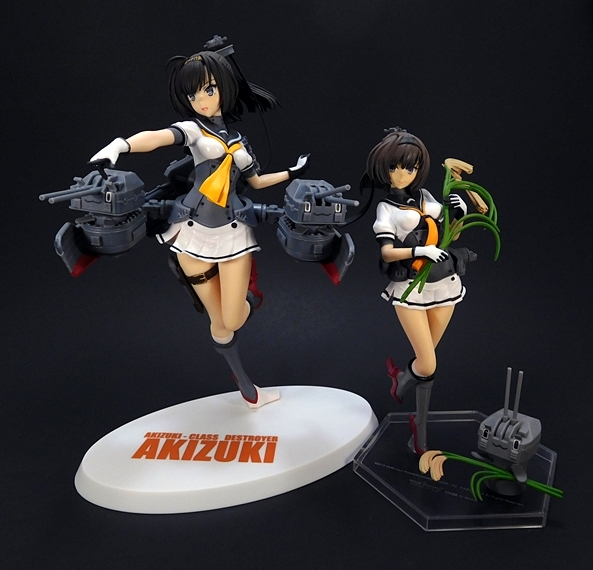 Like her sister, Akizuki set me back only $13 shipped and that’s a pretty amazing deal. The sculpt is sharp, the paint is on point, and I have to say once again how happy I am that Amazon has been a source for these figures, because if it weren’t for them, my collection would be a lot smaller. 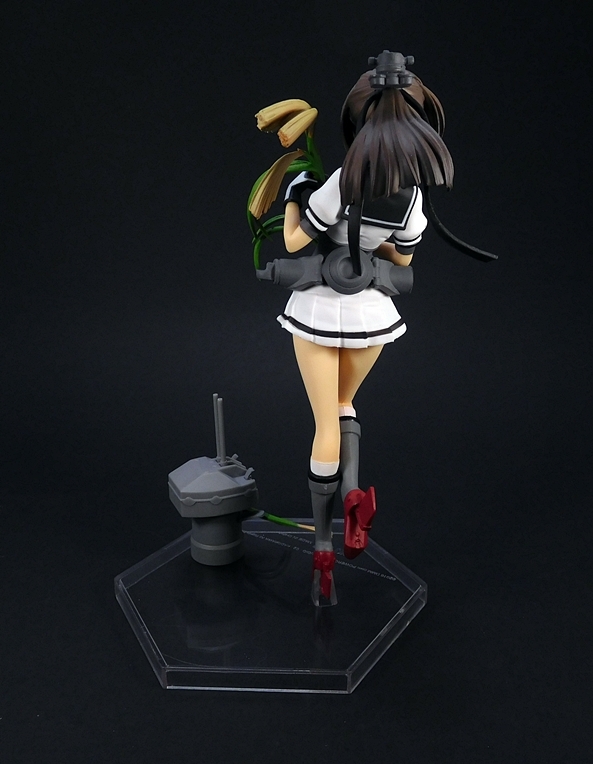 Next Saturday will likely be another helping of KanColle love, but I’m not sure whether it’ll be another prize figure or a Figma release. Either way, I’m starting to get really badly backlogged. Welcome to another Anime Saturday! I’m a little bummed out today because my vacation is coming to a close, so I’m drowning my sorrows this morning in coffee and opening up a new figure to cheer me up. 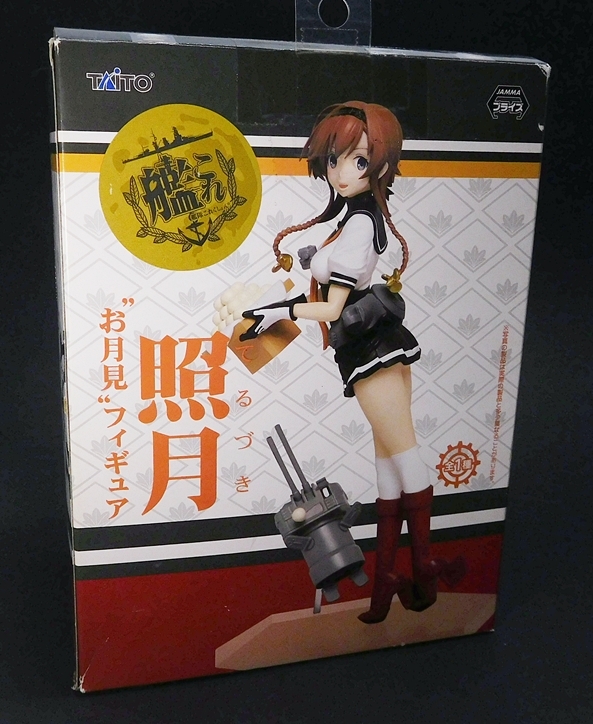 It’s been a little while since I dipped my toe into that sweet, sweet pool of Kantai Collection prize figures, so it’s time to remedy that by unboxing another one of Taito’s lovely Fleet Girls. This time I’m checking out the Akizuki Class Destroyer, Teruzuki! This is the “Moon Viewing” version which is sort of akin to the “Day Off” figures, some of which I’ve looked at before. 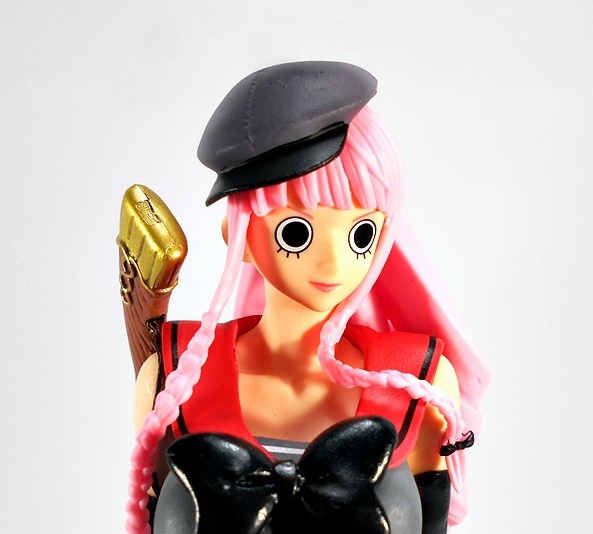 I’ve actually been on the hunt for SEGA’s Super Premium version of Teruzuki, as that one is all geared up, but I have yet to find a domestic source for her. 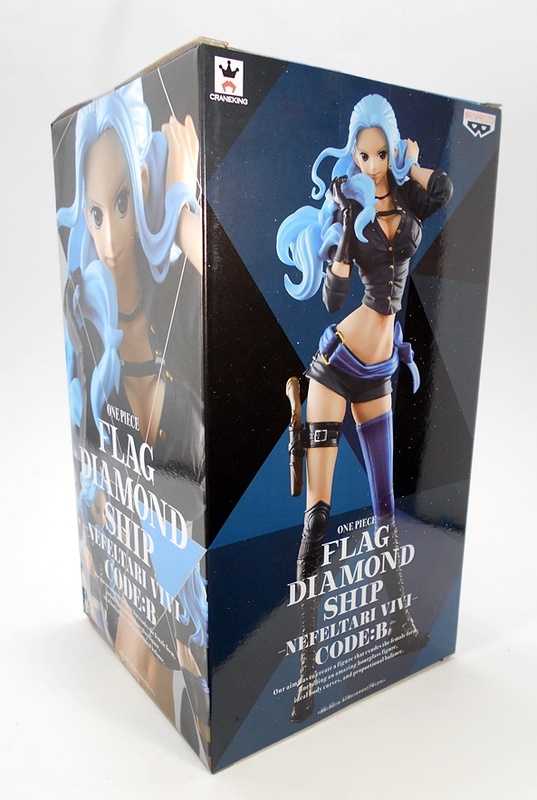 In the meantime, I wound up buying this one just to get her in my collection. 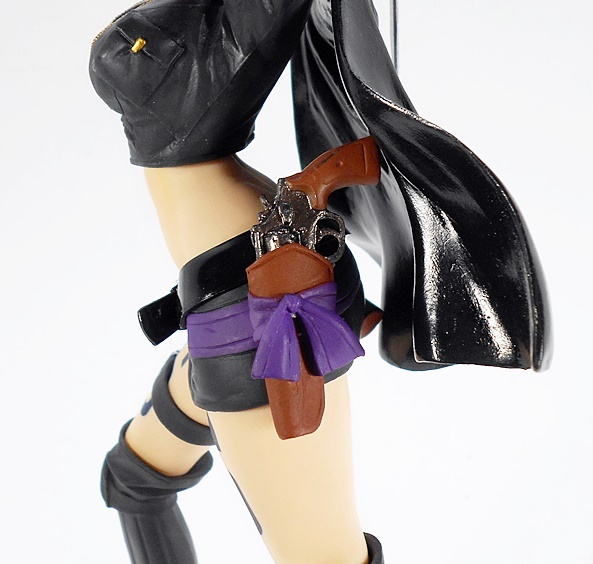 And also because Taito usually does some really nice work with these figures. 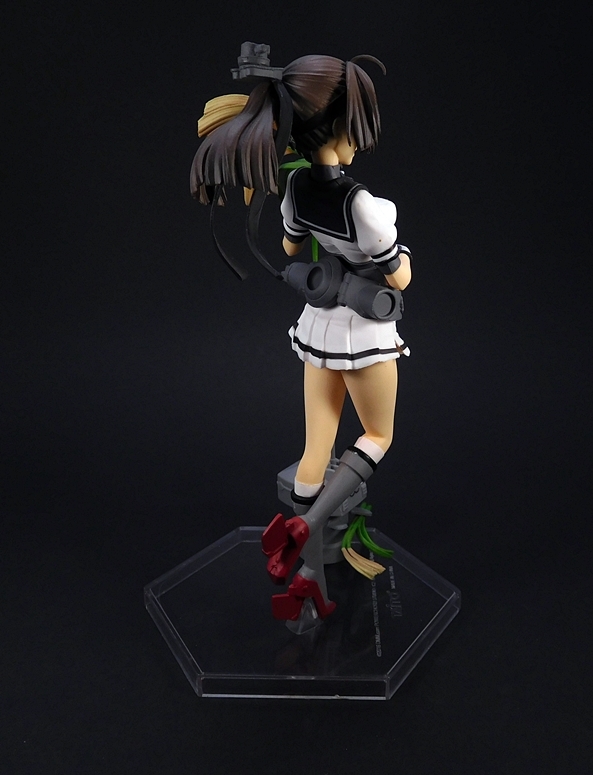 Teruzuki comes in a fully enclosed box with some shots of the figure on the front and side panels. It’s an attractive enough box, but these things are so flimsy that they’re usually pretty rough by the time they get to me. This one was even wrapped in plastic and it still took a pounding. The only English on the box is on the top and bottom panels where it has the figure’s name. You get the ubiquitous JAMMA logo in the upper corner and there are perforations to make handles on the sides. 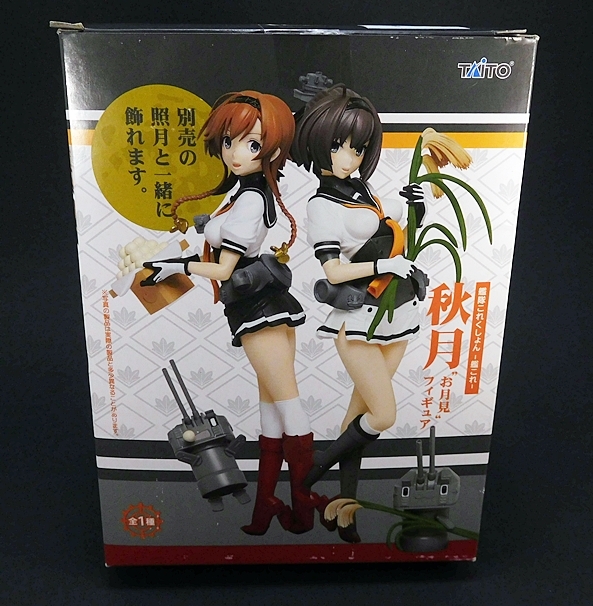 The back panel of the box shows her paired up with her sister-ship, Akizuki. 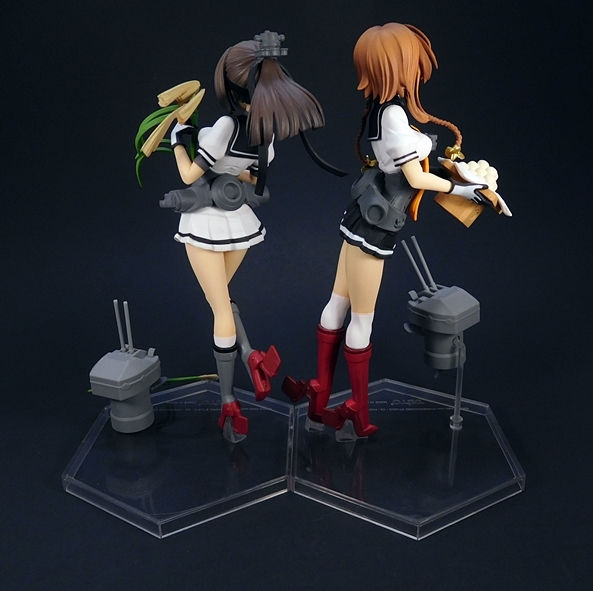 These two Fleet Girls are sold separately, but they’re actually meant to be displayed together. Inside the box, you get some extra bits of reinforcing cardboard and the figure is wrapped in plastic with a little minor assembly required. And as always, these figures are scaled at about 8-inches or so. And here she is all set up and looking adorable. I really dig the pose here. 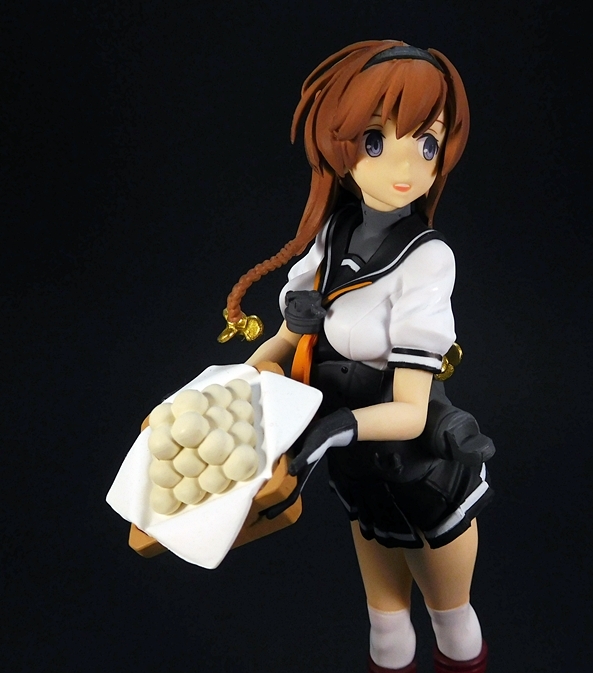 Teruzuki is leaning forward and proudly offering up a box of Dango, which as I understand it are like sweet dumplings and are often enjoyed at the Otsukimi, or Moon Viewing Ceremony. Her sailor uniform is pretty typical stuff with a short pleated skirt, black with white stripes and a white top with a black collar with white stripes to match the skirt. She also has a bright orange neckerchief to add a little color to the ensemble, and it’s secured below her collar with her Anti-Aircraft Fire Detector. What a great little detail! Her outfit is rounded out by a pair of white knee socks and tall red rudder boots. 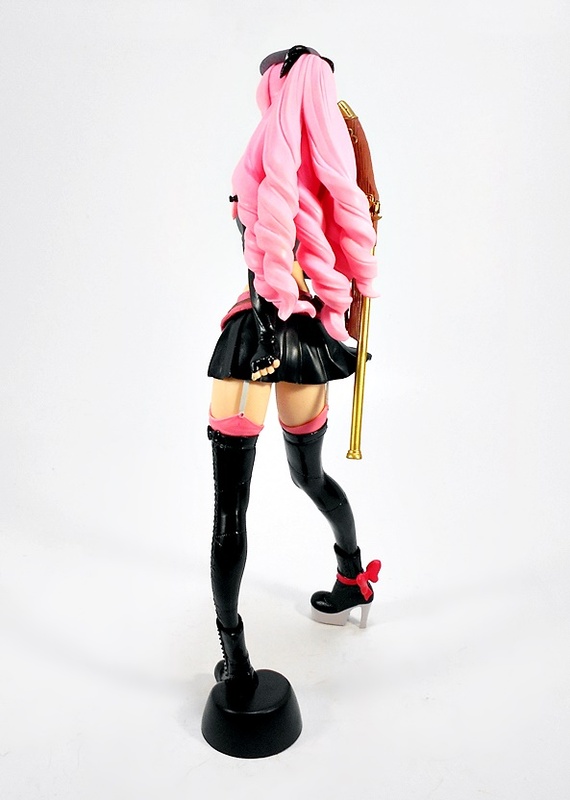 From the back, we can see that despite this being a leisure figure, she still has her arming mount on the back of her waist. 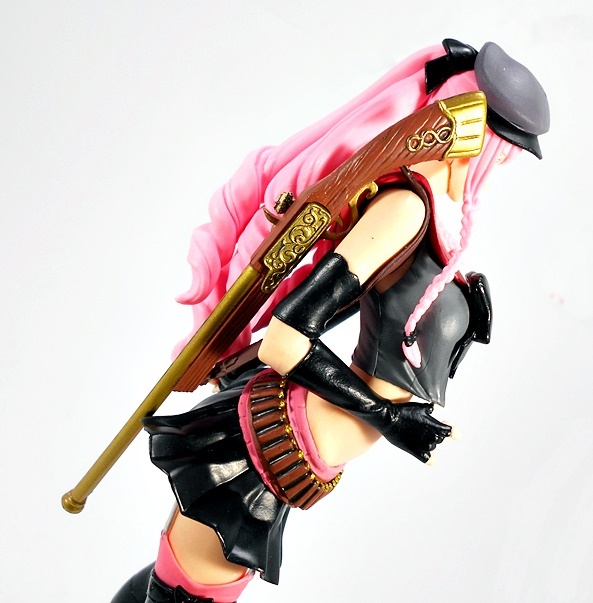 One of the reasons I really want to get a regular version of Teruzuki is because her gear includes a really cool and distinctive pair of drum magazines that she wears on her thighs. The portrait is nice and simple. Her blue eyes are printed looking off to the side and she’s offering a little smile. 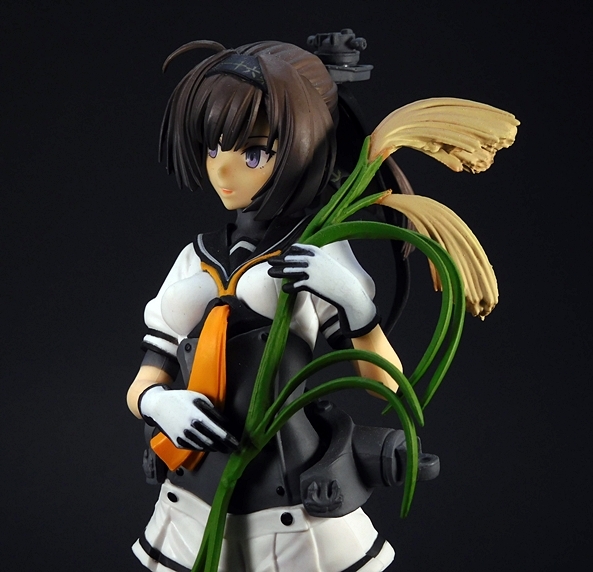 I love the golden propellers at the ends of her pigtails. 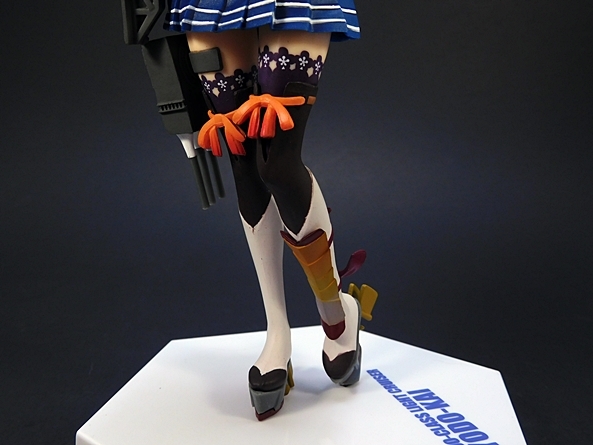 Her headband is also marked “61” in Japanese, as she is part of the 61st Destroyer Division. 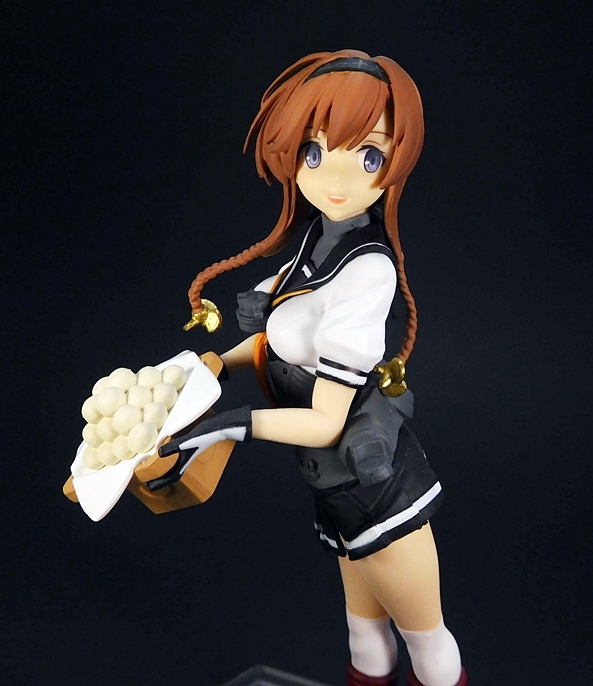 Her mound of tasty Dango are neatly stacked in a pyramid with white linen unfolded to display them. If anyone out there knows how to make Dango, be sure and send me a batch because they sound delicious. 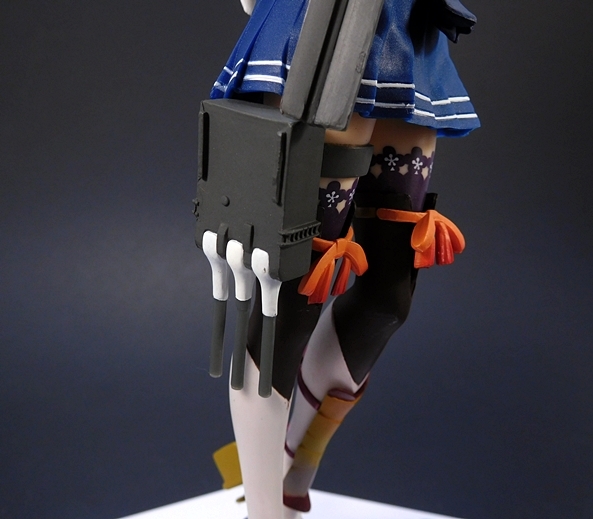 Like the fan favorite Fleet Girl, Shimakaze and her Rouchouchan, Teruzuki is accompanied by her own adorable little sentient gun turret, in this case referred to as Chou-10cm-hou-chan. This little guy is mounted on a ball jointed post and hovering over the base, so you can position him whichever way you like. 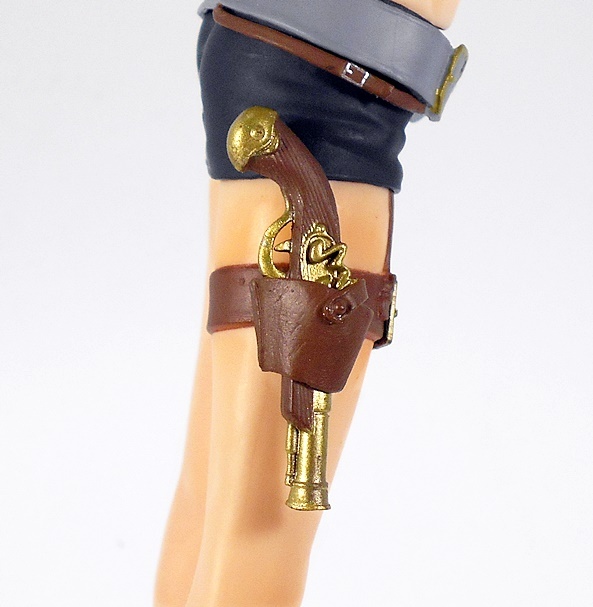 The guns are articulated and he has one view port closed to make it look like he’s winking. He also looks like he’s sucking down a Dango, probably the one missing from the top of the pyramid. 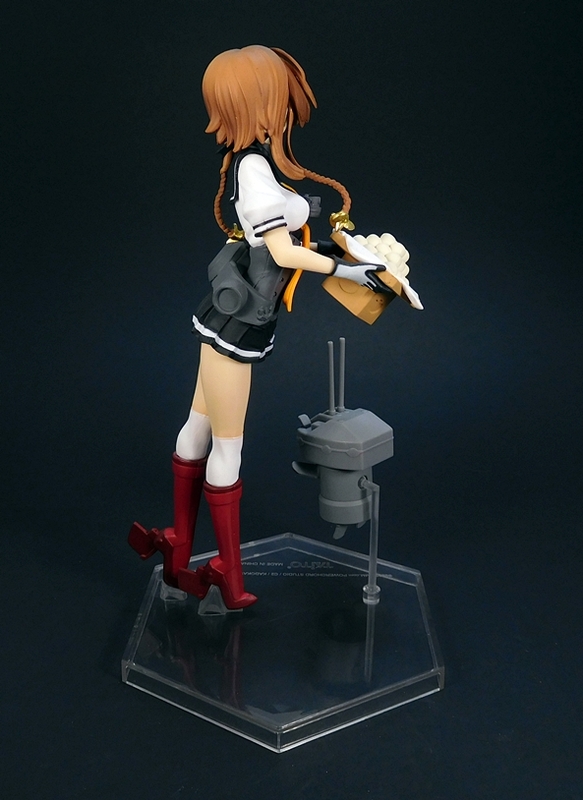 As you can see the base is a simple clear plastic hexagon and Teruzuki is positioned on it so the flat side behind her can sit flush with the opposite side of her sister ship’s base. There’s no name inscribed, which is fine by me. 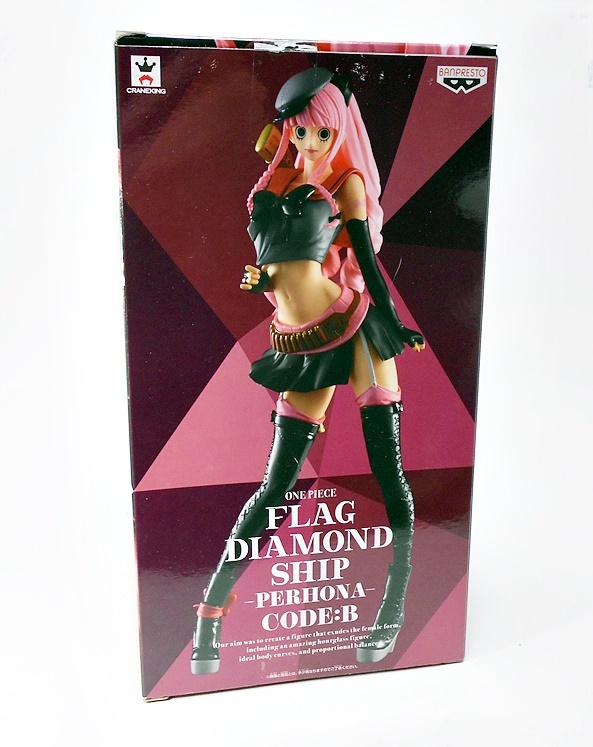 Taito doesn’t tend to put the girls’ names on the bases. 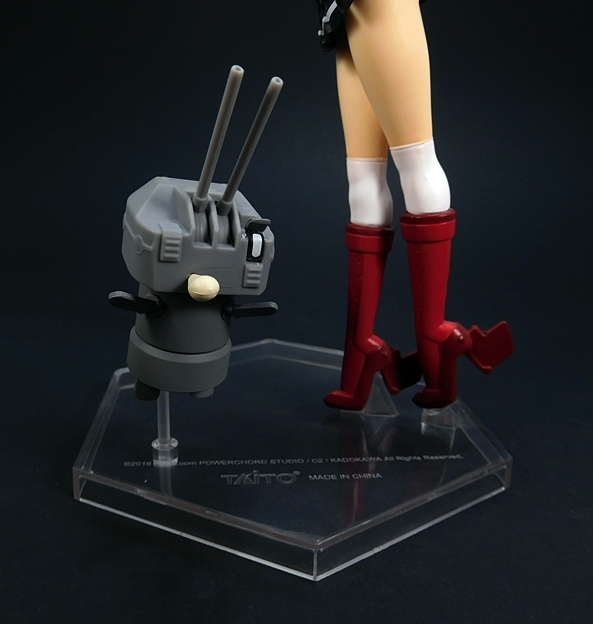 And here’s a shot of her with Taito’s Battleship Yamato “Day Off” figure, just to show that they scale really well together. The OCD in me wishes they would stick with one style of base, but I guess they each have their merits. Also… So much food being served… now I’m hungry. 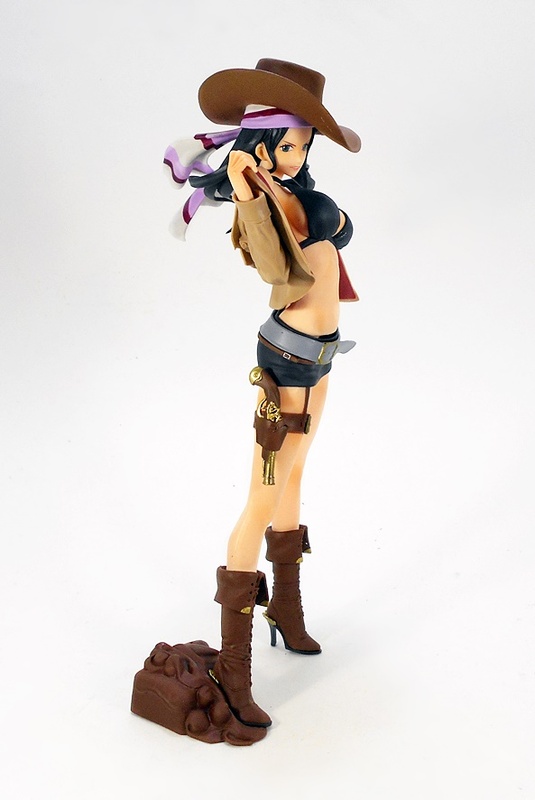 It’s been a while since I bought this figure, but I seem to recall her being a whopping $13 shipped off of Amazon. Honest, folks. 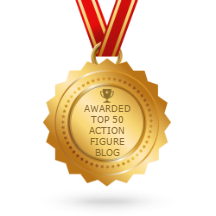 I don’t get any kickbacks from mentioning Amazon, but it really is a great place to grab some of these figures. Anyway, I really like Teruzuki a lot. 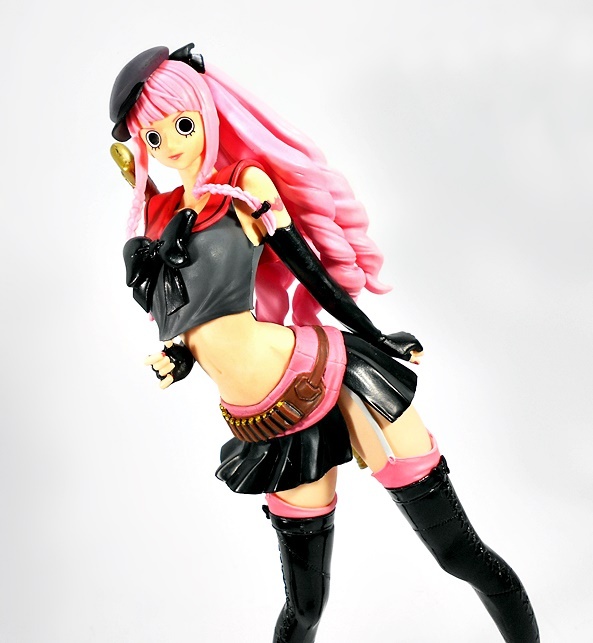 Taito continues to deliver some especially sharp sculpts and clean, vibrant paint for figures in this price range, and all with a wonderful attention to the character’s personality and appearance. 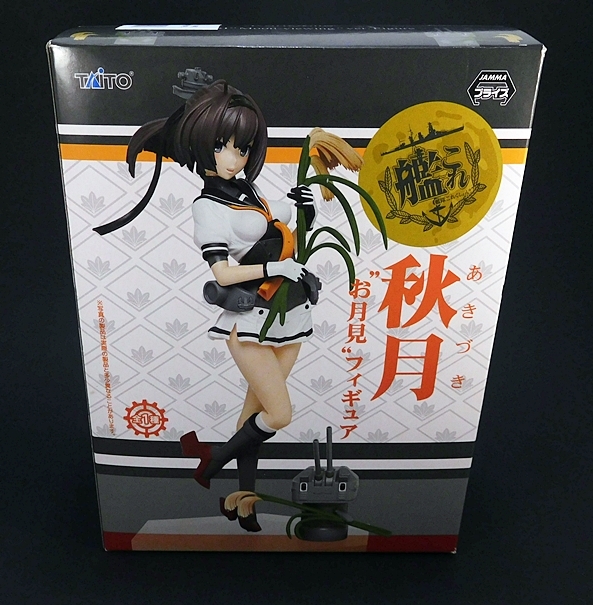 Naturally, I picked her up with the “Moon Viewing” version of Akizuki, and I’ll be checking out that figure next Saturday, as long as time permits.